Paddington: Illustrated and Animated explores how different illustrators and animators have interpreted Michael Bond’s literary creation over the past 50 years. We went along to have a look last week and were also lucky to catch the end of the House of Illustration’s excellent Quentin Blake exhibition, which has now sadly drawn to a close. The House of Illustration is, as its name suggests, all about the art of illustration. It opened the doors to its first permanent home this year, in the fabulous Granary Square in King’s Cross. The Paddington exhibition takes up just one room of gallery space, which was a bit smaller than we had expected. Nonetheless, the artwork on display covers Paddington’s 50 year history, featuring illustrations by the different artists who created the various iterations of the character for books and animations over the years. In fact, until I saw them all in one place I hadn’t appreciated that the many versions of Paddington had differed so much while remaining so instantly recognisable. MJ enjoyed watching footage from the old Paddington stop motion TV series while G and I designed our own bear at the illustration table in the centre of the room. 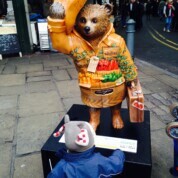 The icing on the cake for MJ was watching a trailer for the new Paddington movie and seeing the 3D Paddington model used in the film. This isn’t a huge exhibition as reflected by the affordable entrance fee, but it’s worth a visit for Paddington fans. We had a picnic in Granary Square afterwards where the orchestrated fountains and nearby canal boats provided extra entertainment and ample space to work off some energy before the train ride home.